It's been a while since I reviewed the Dingbats Wildlife journals (read my review here), but the Lebanese brand hasn't been sitting still in the meantime! 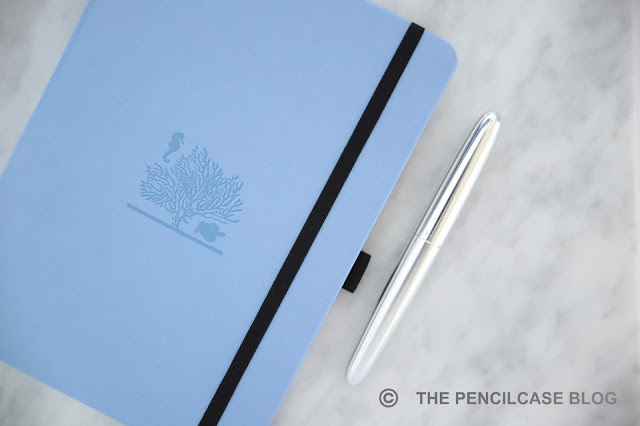 It seems like they gained a good bit of brand recognition along the way -deservedly so-, and earlier this year they released a new line of notebooks: the Earth collection. The Earth notebooks aren't just regular journals. They contain a bunch of features aimed at bullet journalling. To be honest, I know close to nothing about bullet journalling, but I do know that Dingbats created yet another high-quality notebook! Let's start on the outside, because design is definitely a strong suit. I enjoyed the Dingbats Wildlife, but the Earth is every bit as beautiful and detailed (if not better). The outside is a vegan-friendly PU leather that has a very realistic leather texture. It also FEELS like leather, whereas the Wildlife notebooks felt more rubbery. The cover is debossed with the theme of the notebook (three endangered ecosystems), which also matches the color of the journal. However, they went even further with the theme on the inside of the notebook this time around! The first two pages feature a layout with information about the region the notebook is based on, and why it's endangered. 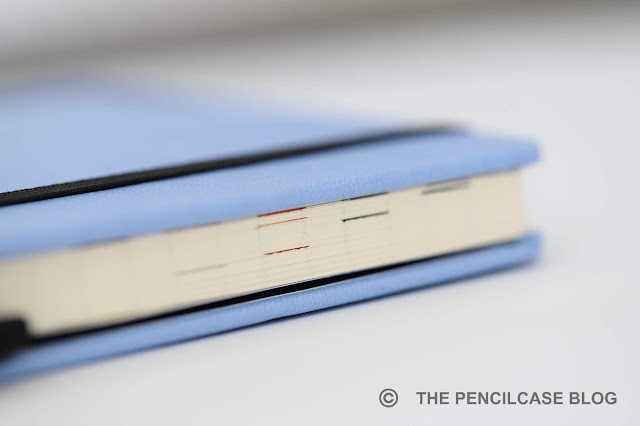 The bullet journal aspect is integrated into the Earth notebooks in a handy, but not overly intrusive way. The first pages let you create a legend for the pagemarkers and tags (the 'Dingbats Key'). These tags can be used throughout the notebook. The tabs on each page can be colored in according to the legend you created. Because the tabs are at the edge of the page, you can see where you marked them even when the notebook is closed (making it easy to find specific entries afterwards). 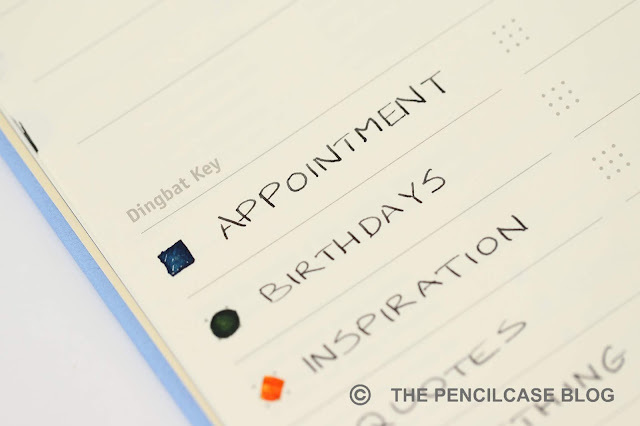 The first five pages are designated as a 'future log', which have guidelines that help you create calendars to track long term projects or ideas. The notebooks are pretty feature-packed. 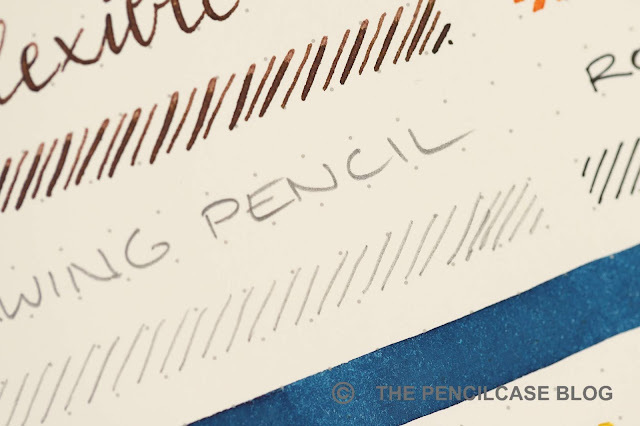 Along with the BuJo features, they also contain the usual features: elastic closure, an index table, two bookmarks, a pen loop, numbered pages, and a back pocket for cards or loose papers. 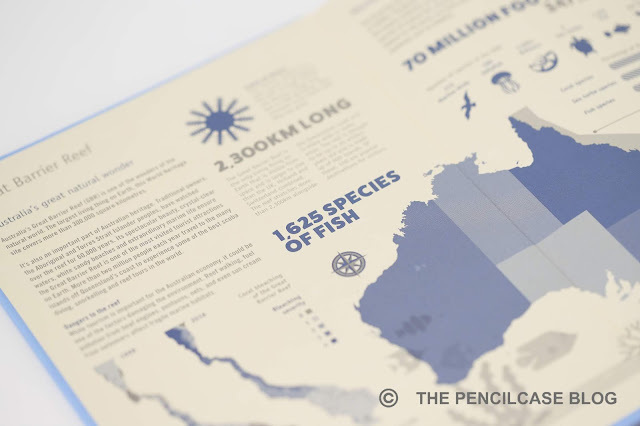 Dingbats' attention to detail is impressive, the environmental theme adds a good bit of story to the product, and the classification system makes it an ideal BuJo. But of course a well-designed notebook is worthless if the paper is no good, so they paid special attention in that department as well! 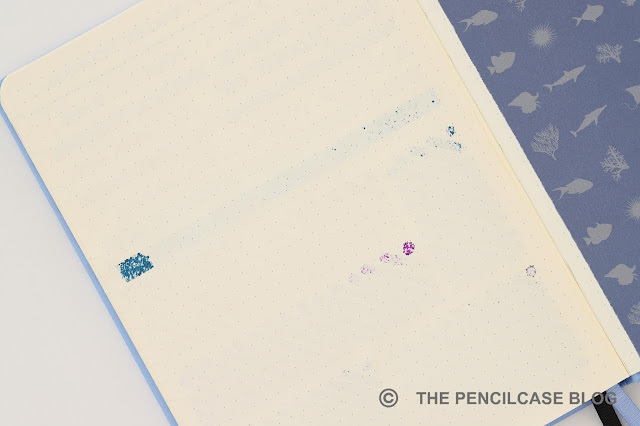 All Dingbats notebooks come with their 100gsm acid-free 'fountain pen friendly' paper in cream color. 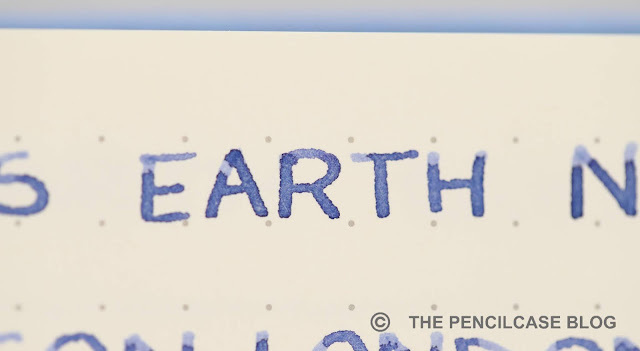 From experience, I know that the term 'fountain pen friendly' is often used quite freely, but Dingbats paper ranks quite high on my list. The smooth paper is very pleasant to write on with fountain pen, yet it is not too slick, so I encountered relatively little skipping or hard starts in my testing. Because it's a heavyweight paper, it shows though only a little bit, even with wet writers. Bleedthrough is also relatively well-contained, or not present at all with fine or not-too-wet nibs. 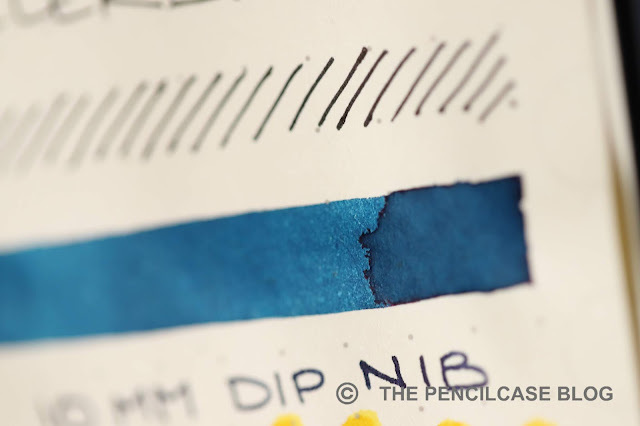 It also depends strongly on what inks you use, as some inks are just notorious for bleeding and feathering on most paper types. The paper held up quite well in my stress test: a 10 mm dip nib left no feathering and only some bleedthrough, mostly where the ink pooled. Ink swabs behaved well too, with minimal bleedthrough. 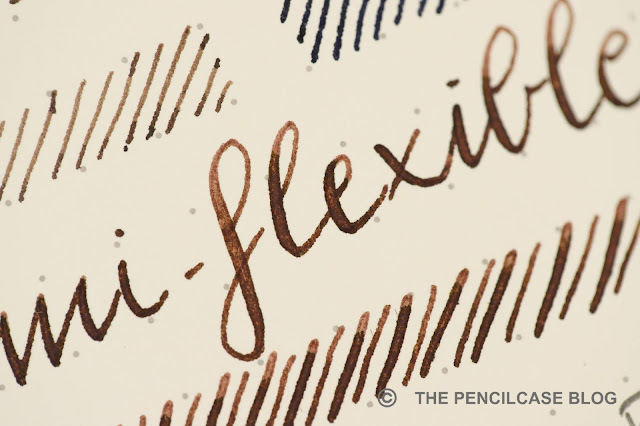 The paper brings out a fair bit of shading, although not with as much depth as some paper types are able to. 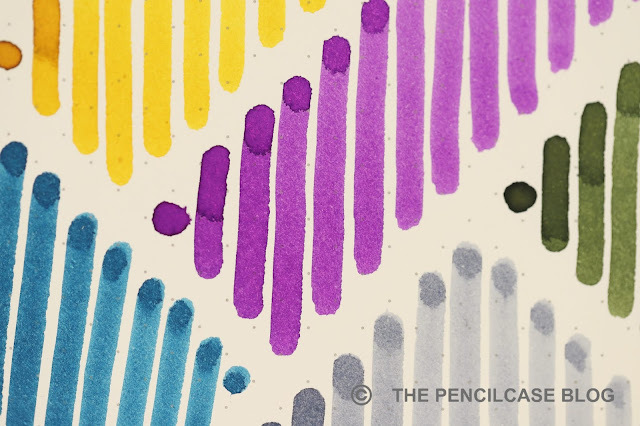 Sheen is not overly present in normal writing, and even in the ink swabs I had to look closely to find any. My overall experience with this paper is excellent. It's definitely fountain pen friendly and holds up well, even with very wet writers. I encountered little to no feathering at all. Both the Wildlife notebooks and this one, show that Dingbats puts a lot of thought and effort in their products. They created a notebook that looks great (IMHO even better than the Wildlife) and has excellent paper. 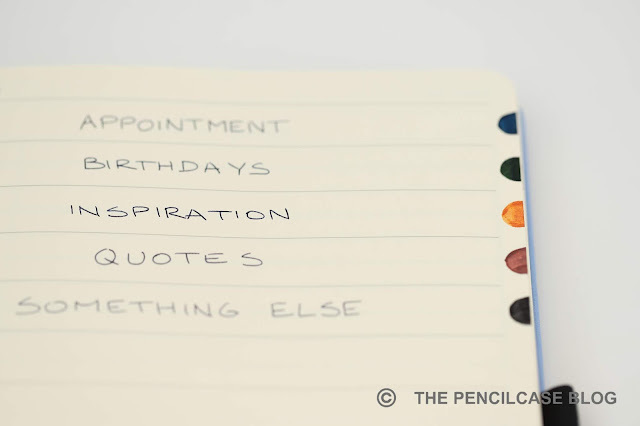 On top of that, the bullet journal aspect is very cleverly worked out and adds a lot of functionality in a subtle way. Even if you don't specifically use it as a BuJo, the classification system is perfect to catalog notes and scribbles. 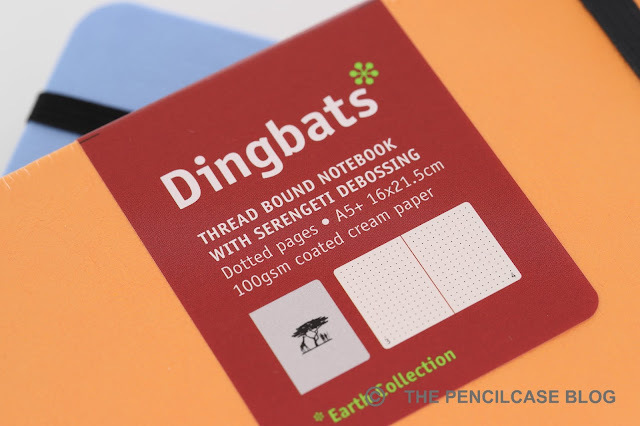 Coming in at 20€ / 22$, the Dingbats Earth notebooks are quite reasonably priced. It's cheaper than other BuJo alternatives (such as the Leuchtturm Bullet Journal), but still a bit more expensive than regular notebooks. This product was sent to me by Dingbats so I could write this review. I was in no way influenced in the making of this review, the opinions shared in this review are completely my own! This post does not contain affilate links.